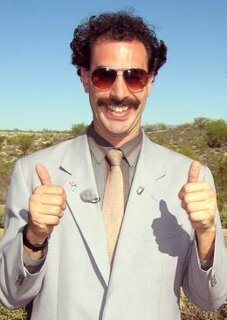 Kazakhstan spoof reporter Borat may be working tirelessly to - in a roundabout way - raise the profile of his adoptive country, but travel websites are also reaping the benefits of his tomfoolery. Expedia-owned accommodation aggregator Hotels.com has apparently seen a 300% surge in searches for hotels in the much-maligned Asian country following the release of the recent Borat movie, starring comedian Sacha Baron Cohen. For those uninitiated in the world of Kazakhstani hotels, there are actually a string of high profile properties in the country including the Hyatt Regency Almaty, Best Eastern Otrar, Premier Alatau Hotel, and the Best Eastern Ambassador Almaty. So enthused by all things Borat, and clearly not wishing to miss a trick with consumers, Hotels.com is apparently going to expand its Kazakhstan portfolio. It goes to show you how people react.